One survival skill that is often overlooked is the ability to cook food, in the wild, particularly if you have lost or cannot access your normal outdoor cooking gear. Almost anyone can work through cooking outdoors if you have the right gear, but what if you do not? If you are lost or in a SHTF situation, without your normal cooking utensils, one way you can still cook food is to cook directly on coals. That sounds counter-intuitive, but in reality, cooking on coals lets you better control the cooking process and avoids burning your food by cooking on an open flame. You do have to contend with a little ash, but you can brush most of that off. 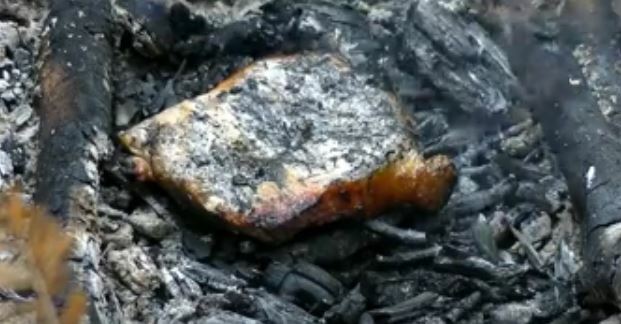 Plus, in a survival situation, if you are forced to cook your own food in the wild, a little ash will not hurt you. The video on the next page shows you how.